Located on the Yamuna river Paonta Sahib is associated with Guru Gobind Singh, the 10th Sikh Guru who lived here for about three years. In the closing years of the seventeenth century, the Sikh Guru came to the princely state of Sirmaur on the invitation of its ruler Maidni Prakash. After surveying the area he decided to camp by the river Yamuna and his stay here became the foundation for the town of Paonta Sahib. ‘Paonta’ means ‘a space (or place) for a foothold’ the foundations of the Gurudwara were set by Guru Gobind Singh. The Gurudwara overlooks the Yamuna which flows by rather quietly. Paonta commands fine views of the Doon valley and the nearby hills.There are also two temples of Rama and Krishna. The ground is shaded by trees. It is the venue for the Hola and Baisakhi fairs held in March / April. The Gurudwara has a palanquin of gold donated by a devotee. Shri Talab Asthan and Shri Dastar Asthan are two notable places inside the gurudwara. Kavi Darbar is near the Gurudwara. It is the venue for holding poetry competitions. The weapons and pens used by Guru Gobind Singh are displayed in the museum. The Gurudwara is visited by Sikh pilgrims from all over India and abroad. There is also a temple dedicated to the Yamuna river. 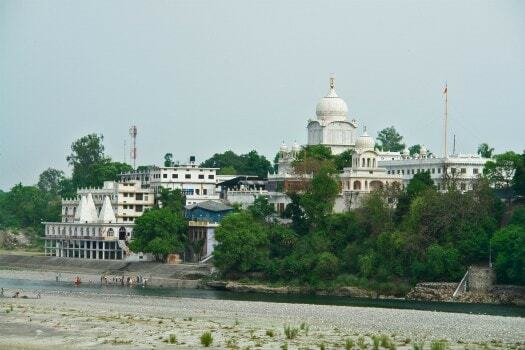 It lies immediately below the Gurudwara on the banks of the river. The Gurudwaras of Bhagani Sahib, Tirgadi Sahib and Sherga Sahib are also close to Paonta. Other notable pilgrimage places are the Shiva temple at Patlian (5km), the one of Baba Garb Nath (8km), the Nagnauna Temple (16km), the temple of Katasan Devi (30km). The ‘Mahaar’ of Bhure Shah lies on a hill across the river and no pilgrimage to Paonta Sahib is considered to be complete without a visit to the grave of this contemporary of Guru Gobind Singh. Apart from these places of pilgrimage, the Asan Barrage on the river Yamuna across offers water sports. Paonta Sahib is 45 km from Nahan. Temperature: In winter the temperature can hover around freezing point and summers are hot and pleasant. Clothing: Cotton clothes in Summer and Heavy woolens in winter. Where to stay: There is adequate accommodation in Paonta Sahib. Visitors can stay at the HPTDC Hotel Yamuna, PWD Rest House, Paonta Sahib Gurudwara, Mata Bala Sundri Sarai and in some private lodges and hotels. By Road : Paonta Sahib is easily approachable from Nahan (45 Km), Dehra Dun (45 Km), Haridwar (117 Km), Shimla (180 Km) by bus, car or taxi. By Rail :Nearest railway stations are at Ambala and Dehradun. Khodri Dak Patthar is a perfect picnic spot. Visit Himachal’s research station of fruits and agriculture at Dhaula Kuan. The town of Renuka, situated 50 Km from Paonta Sahib observes a religious fair which includes cultural programmes organized during the evenings. The fair brings wholesome entertainment to the tourists and locals. This annual fair is scheduled to be organized in October/November. This fair is organized in the town of Nahan situated at 45 Km from Paonta Sahib, during the Chaitra Navratri in March/April and Ashwin Navratra’s in September/October. A large number of Pilgrims visits the Balasundari Temple at Trilokpuri and seeks holy blessings. At a modest elevation of 3647 m, Churdhar is the highest peak outside the Himalayan range. Few know that it is from the top of this peak George Everest made his astronomical reading of the Himalayan Mountains. Chur-Dhar is also called Chur-Chandni Dhar (Bangles of snow ridge). Another name is Chur Chandni, which means a mountain dressed in moonlight. 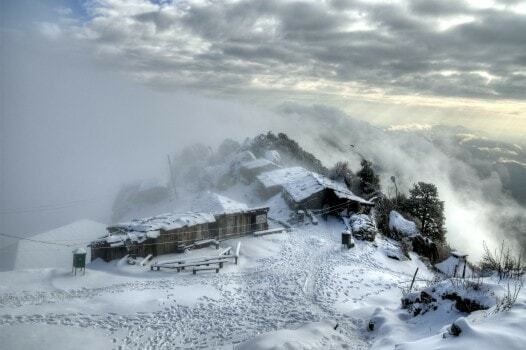 This peak is visible from Shimla, Kasauli, Solan & Kufri and retains a streak of snow for nearly half the year. The approach to Churdhar top can be done from three sides. One can reach from Nauradhar 12 km, from Haripurdhar 12 km and from Chopal 8 km. There is the temple of Bhangyani Devi. Haripurdhar (2687m) is 83 km from Nahan, 61 km from Rajgarh and 35 km from Nauradhar. There are rest houses at Shillai, Kafota and Ronhat. You can also visit Nauradhar, Sataun, Kamrau and Rajban. Spread over 400 acres and located amidst the sylvan surroundings, Baru Sahib has come up in recent years. It can be reached from Solan, Rajgarh route (63 km). At 2063 m Habban valley is a scenic village. It is surrounded by a deodar forest. There are orchards of peach and apple. You can trek from here to Churdhar. Habban is 51 km from Solan. Sirmauri Tal is on the southern bank of the Giri river and was once the seat of the Sirmaur Kings. The story is that it was destroyed in a flood after being cursed by a court dancing girl when the ruler went back on an oath to give half of his kingdom if she crossed a narrow gorge on a rope. This, she did but the wily ruler offered her the entire kingdom if she could dance her way back. 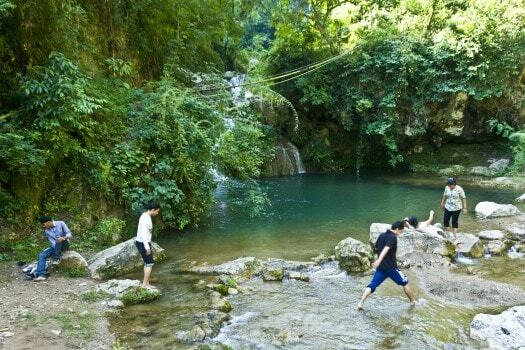 She started back but as she was halfway across, he cut the rope hurling the helpless girl into the stream. It is said floods followed which swept away the town. It is 16 km from Paonta Sahib and 25 km from Nahan. At 1668 m it is located on a hill top and commands a panoramic view of the plains including Chandigarh by night. There are also views of the Churdhar mountain. Pleasent morning and evening breeze blows. Sarahan is 42 km from Nahan, Dagshai is 34 km and Solan 52 km. It is a quiet place amidst pine, forest, apple, and stone fruit orchards. Rajgarh is particularly known for its peach orchards. The Rajgarh fort was demolished by the Gorkhas in 1814, but was later restored. It is 40 km from Solan. There are Rest houses and lodges available. It is beautiful picnic spot just 25 Km from Paonta Sahib. There is a beautiful park, a swimming pool and a tourist bungal, w. At this place the torrential river Yamuna has been tamed into an artificial lake. The canal-side drive from Paonta to Khodri is a pleasure. Chhibran power house is a unique sight to see as the entire structure has been built underground.